Turkey is in talks with Russia to buy S-400 surface-to-air missiles. ANKARA, Turkey — In what would be a snub to NATO, the Turkish government has said it may buy the Russian-made S-400 for its near-mystery program to build the country's first long-range air and anti-missile defense system. Defence Minister Fikri Isik said Feb. 22 that talks between Turkey and Russia for the potential acquisition of the S-400 system "made quite [the] progress." "The S-400 [system] looks like the closest option," Isik said. But the minister cautioned that "we are not at a stage of signing a deal tomorrow." Isik said that Turkey's priority was to indigenously develop a system that would permanently protect Turkey against any attack. Isik's statement came when the three-nation group that builds the Medium Extended Air Defense System, or MEADS, was offering Turkey what looks like a customized partnership to construct a long-range air defense architecture for the country. Turkey and the MEADS group have been in talks for a potential deal since April. 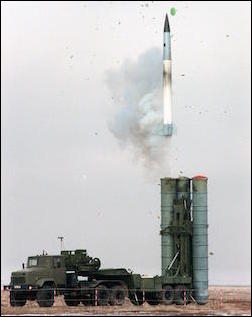 For its long-range air defense system, dubbed T-LORAMIDS, Turkey in September 2013 selected China Precision Machinery Import-Export Corporation's $3.44 billion solution, which defeated rival bids from Eurosam, maker of the SAMP/T; a consortium of Lockheed Martin and Raytheon, maker of the Patriot system; and the Russian-made S-300/S-400 option. In its 2013 assessment, Turkey's procurement officials found the Russian offer "exorbitantly expensive." Under pressure from its NATO allies, Turkey later scrapped the preliminary deal with CPMIEC and the competition.